The Jacuzzi rooms at the Valley Forge Inn create the perfect romantic atmosphere for your Valentine’s Day celebration. Just imagine cuddling together to end a perfect day in the Smoky Mountains! These spacious rooms also include a refrigerator where you can keep a bottle of champagne or any of your other favorite beverages cold. Many of our Jacuzzi rooms even have their own private balcony where you can step outside for a fresh breath of the mountain air and gaze up at the twinkling night sky. One awesome benefit about our Jacuzzi rooms in Pigeon Forge is that they are within convenient walking distance to a variety of tempting restaurants! Our hotel is practically right next door to The Island in Pigeon Forge where you can enjoy a delicious Valentine’s Day dinner at one of the popular restaurants there. While you are visiting, be sure to check out The Island Show Fountain or go for a spin on the Great Smoky Mountain Wheel. If you want to dine out for breakfast, we are also within easy walking distance to a variety of restaurants serving up early morning favorites. Just keep in mind that we offer a free continental breakfast for each and every day of your stay! While many hotels may charge a premium on special nights like Valentine’s Day, you can count on the Valley Forge Inn to offer affordable room rates every night of the year! 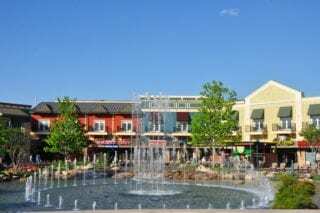 This means that you can enjoy a Pigeon Forge getaway without spending a fortune, leaving plenty of money to spend on fun stuff like attractions, shopping and dining out. Be sure to check out all of our Pigeon Forge hotel specials when making your plans because we offer a variety of incredible deals! When you spend Valentine’s Day in our Jacuzzi rooms in Pigeon Forge TN, you can take advantage of all of our fantastic hotel amenities! Even if it’s chilly outside, remember to pack a bathing suit because we offer a refreshing indoor pool with a hot tub for your enjoyment! We are also pleased to offer free wireless Internet access throughout our hotel so that you can make restaurant reservations, research hiking trails at the national park and let your friends know how much fun you are having at the Valley Forge Inn! Check out our Jacuzzi rooms in Pigeon Forge TN today to plan your Valentine’s Day getaway to the Great Smoky Mountains! We look forward to seeing you soon at the Valley Forge Inn!